London, UK – Drummer Dylan Howe, son of YES guitar legend Steve Howe, has recorded a radical new take on the instrumental cuts from David Bowie’s 1977 albums ‘Low’ and ‘Heroes’. 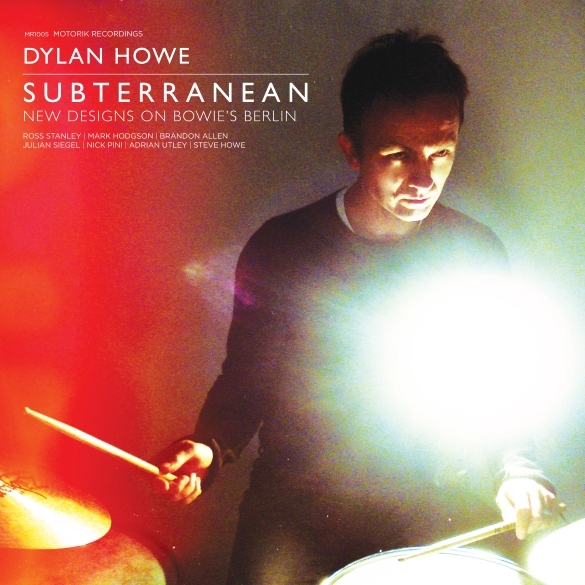 ‘Subterranean’ is Dylan Howe’s first studio album in ten years. It is made up of his arrangements of Bowie’s influential music from his ‘Berlin Trilogy’ and has been seven years in the making. Some of the music featured on this album was previewed live at the London Jazz festival in October 2007. This is the completed album and is universally accepted as Howe’s strongest to date. It features some of the best musicians in the UK with special guest Steve Howe playing koto (‘Moss Garden’). The response to ‘Subterranean’ has been simply phenomenal; it has garnered universal critical and popular acclaim from all corners of the globe with sales to match. The CD is already in its third pressing with the double vinyl well into its second. David Bowie recently sent a message to Dylan saying; ‘That’s a top-notch album you’ve got there. Really.’ He requested a vinyl copy the following day. Recently Dylan played on the no.1 album ‘Going Back Home’ by Wilko Johnson and Roger Daltrey, with sell-out shows at London’s Shepherds Bush Empire and Royal Albert Hall. This new album (his sixth) is the natural progression from his acclaimed 2010 Stravinsky adaptation ‘The Rite Of Spring’ for piano and drums and Blue Note styled hard bop quintet albums Translation – Volumes 1 and 2.